Though reports early last year said that a deal between CBS and Google for YouTube distribution had fallen by the wayside, the network's content will soon be available in full on the popular video site, complete with commercials. Announcing on Friday that "Full-Length TV Dinners" would be coming to the Site, YouTube's team blog noted that it will naturally first be a test. Advertisements could be pre-, mid-, or post-roll, but will only appear in the premium full-length content. In our tests -- which, granted, only lasted a few minutes this morning -- we didn't see any overlaid advertising in premium content, though overlay ads do appear in "clips" from CBS shows (including the Evening News), which only last a few minutes. 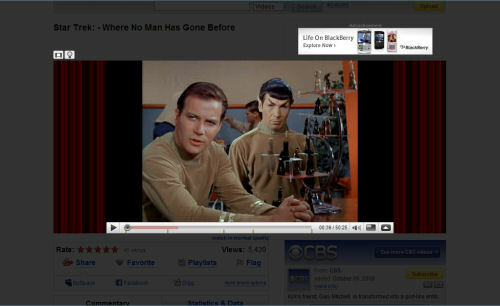 YouTube will receive some classic Paramount shows that didn't actually ever appear on CBS, such as "Beverly Hills 90210," "MacGyver," and "Star Trek" in its recently-added "Theater View" mode -- a button just to the upper left of the video. Theater mode is a view extremely similar to video site Hulu, complete with a "Dim the lights" button. NBCU and News Corp.'s Hulu, and similar sites such as Comcast's Fancast, and Time Warner's Veoh, offer content from across multiple US television networks. YouTube has until now not been classed with these sites, despite their purposes being intrinsically similar. As a repository for amateur videos, YouTube's mean production quality is much lower than those sites which only host professional content. With the new "Dim the lights" mode for YouTube's premium content, a red curtain shows up to either side of the video, giving you more unimpeded access to the screen, the controls...and the sponsor. The CBS Audience Network has been attempting to make content owned by CBS as broadly available as possible online, and by securing a position on the Web's most popular video destination with more than 300 million registered users, CBS has secured a strong potential source of advertising revenue.